Sean Dyche was a 25-year-old centre-back on three grand a month and captain of third division Chesterfield Town when Arsene Wenger left Grampus Eight in Japan to become the manager of Arsenal Football Club in October 1996. Chesterfield reached the semi-finals of the FA Cup that season. Dyche scored a penalty against Middlesbrough, including Ravanelli, Juninho et al, to go two-up at Old Trafford in a game which had everything and ended in a 3-3 draw. The minnows were denied a goal which crossed over the line, but scored a 119th-minute equaliser. Bryan Robson's Boro, later relegated from the Premier League, won the replay 3-0 and lost to Chelsea in the final. Dyche, now 46, and in his fifth season at Turf Moor as Burnley manager, earned a move to ambitious Bristol City on the back of his impressive performances for Chesterfield. Two weeks ago, Chesterfield were relegated from the Football League for the first time in their 97-year history. Dyche said: "We got a bonus for the semi-final, which was genius, the chairman was that tight he would turn the grill off to stop bacon cooking and he had us on appearance money rather than win bonuses. Of course we weren't expected to reach the FA Cup semi-final so he had some mad figure like four grand. We got there and it went to a replay! "The top wages then were about 30, 40 grand a year for top players in that division, so you can imagine. An eight-grand bonus for all the lads . . . I remember that. We were buzzing. I bought a car for five grand and by then I was on the cusp of moving to Bristol City. "It is so sad what has happened there this season. So sad. We played Stoke a few weeks ago and I jumped in the car and went straight over to Chesterfield to do a Q&A with John Duncan to help raise some money for the supporters. They're desperate. They'd just gone down the night before, so it was a good night considering. It's a good club, I can't really believe it, but it just shows, that's football." Today the Burnley manager will be last man in the guard of honour as both sets of players welcome Wenger on to the Emirates pitch for his last game in charge of an Arsenal team at the home he built for the club he loves. There are Arsenal fans who have dreamed of this day. To them, Wenger outstayed his welcome and his purpose years ago but even they can appreciate the significance of the day and the man. It promises to be emotional. The occasion is not lost on Dyche. He is a football man, honoured to be in Wenger's company, and among the few who have been welcomed into the Frenchman's inner sanctum post-match. Dyche said: "I've known Steve Bould for years so I think he put a good word in for me, I'm always interested in asking him questions about Arsenal and how it moves forward. And he's quite intrigued by our stories as well. He was asking me about us, how it worked in terms of the finances, and how we managed to keep moving forward. He's been quite impressed by that side of things, because as you know, he's keen on the business of Arsenal. "But I've never really analysed it with him. It just seems to come up in conversation. We just chat around that and the challenges of modern football. But I found him to be a really good fella, very open and enjoyed his company on a few occasions after games." Burnley are a point away from qualifying for the Europa League, and just three points behind Wenger's sixth-placed Arsenal, who have a game on Wednesday at Leicester in hand. Burnley have never been in this season for the fun of it. "The day is all about him," said Dyche. "The only bit that is about everyone is the game, when the whistle blows, and we will be focused on that." Dyche will make his own personal presentation to Wenger. It is arguably his toughest challenge of the day. 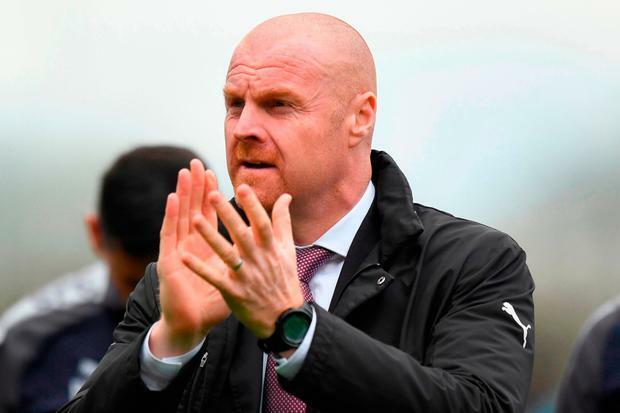 "I'm a beer man," said Dyche, who discovered this week that Burnley landlady Justine Lorriman plans to change her pub's name from the Princess Royal to the 'Royal Dyche Arms' if his team qualify for Europe. When they were relegated three years ago, the club, the region, the fans, the manager, the players, took the hit. They built a fantastic training ground in the grounds of a country house in the town, tweaked the squad, without overspending, stormed the Championship. Sixteenth last season, HQ completed, Dyche ignored the speculation linking him with Everton earlier in the season to concentrate on an evolving project which, with five Irish internationals on board, is now heading to the continent. Wenger built an empire over 22 years. Dyche, in his fifth year at Burnley, after a brief stint with Watford, is doing the same. He is 36/1 for the Arsenal job now. The odds will tumble as he and Burnley progress. "I would not put your money on me," he said. But he is the same odds as Atletico Madrid boss Diego Simeone, who knocked Arsenal out of the Europa League semi-finals this week and denied Wenger the fairytale farewell even Dyche admitted he was wishing for. Dyche is fascinating listening in full flow. "Simeone is an interesting one," he said. "Year one, 'Oh I don't like this, it's not Spanish football.' Year two. 'Tell you what, he does it well.' Year three, 'They have their own style, press and they harry teams.' Year four, 'They're good at what they do, they press and harry and they can play a bit too'. Year five, 'Amazing, what a team.' Fact is they are still doing what they did in year one. It's weird that Simeone has been untrendy and become trendy just by doing what he believes is right." So is there a Sean Dyche timeline he'd like to share? "No. But I see the similarity in my thinking. Not in the style, but we have been through that a lot. People say we do this that and the other, and this that and the other, and then say, well, actually, they're not bad. Arsene Wenger built something and that is what I have wanted to do here with this team from day one. People are looking at us, the Europa and saying, are they going to go off the cliff? Or is there a smooth path? We don't know. But if it is the next part of the journey, we will be prepared for it and we will see where it takes us."